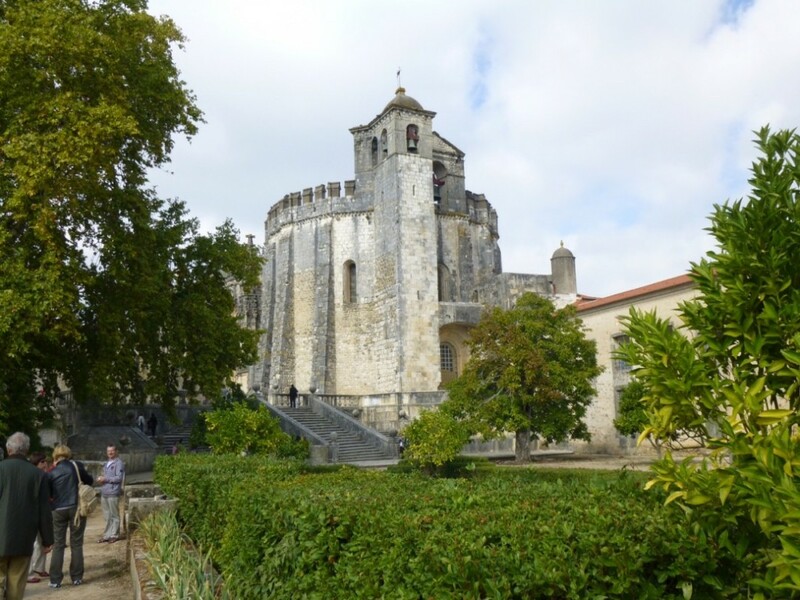 On the last full day of their visit, Sandra, her family, my husband, and I took the pleasant two-hour train ride to Tomar, where the Knights Templar lived in a convent atop a hill. Now I know convent usually refers to the residence of nuns, but that’s what the Knights Templar called their palace and I’m not going to argue with them. The place is huge, and the furnishings reflect the wealth that they amassed. How huge? 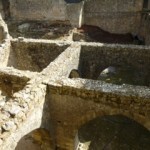 This is only part of the fortified exterior. Behind the fortifications are orchards and gardens that could keep a lot of people alive in case of a siege. Prince Henry the Navigator had his house attached to the convent, but unlike the convent, it didn’t stand the test of time. 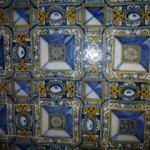 Some of the convent’s features include exquisite tiles with 3-D effects that my camera didn’t quite capture. 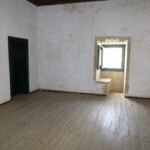 This is a typical “cell” of a Knight Templar. The knights enjoyed a surprising amount of space and comfort. 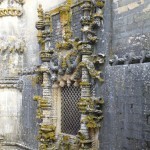 The Manueline (named after the Portuguese king at the time) window is characterized by realistic carvings that highlighted aspects of life in the country, including seafarers’ ropes, chains, and seaweed. 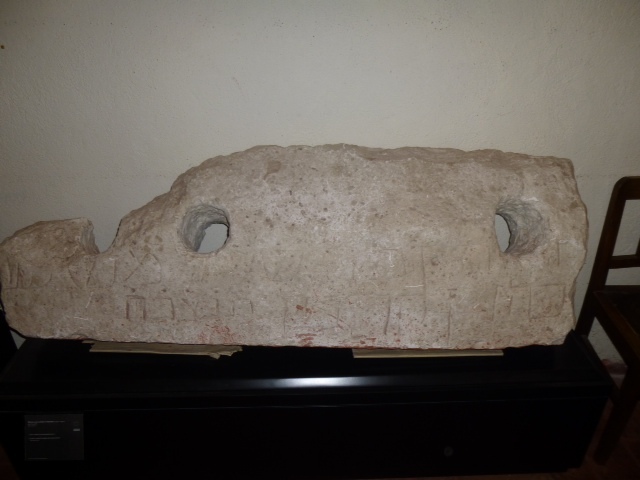 There are a number of other Manueline carvings in wood and stone with similar details throughout the castle. After we left the Knights Templar, we visited the oldest standing synagogue in Portugal, which is located in the old Jewish quarter of Tomar. The Inquisition came later to Portugal than to Spain, and until the early 1600’s the Jews of Tomar benefitted from the protection of the Knights Templar, with whom they traded. 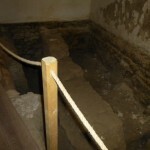 The small synagogue had gravestones from the 7th century, testifying to the long history of Sephardic Jews in the country. This is one of the 7th century headstones, with words in Hebrew. Because this is a Sephardic sanctuary, the bimah is in the center of the room, rather than at the end next to the ark, the way the Ashkenazic Jews from Central and Eastern Europe put it. However, the ark is placed so that the congregants are facing Jerusalem when they see it. Above the ark is the Ner Tamid, or Everlasting Light. 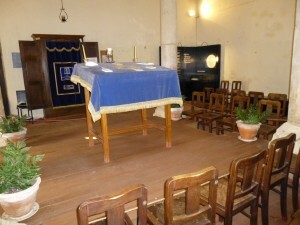 The synagogue in Tomar closed at the time of the Inquisition, when the country’s Jews were forced to convert or leave. It had a number of purposes, and the adjoining room — the one behind the ark — where women sat was sold to make a private residence. 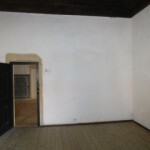 As a result, we were not able to see the area where the women had to sit separately, or where the synagogue had a Kosher kitchen. 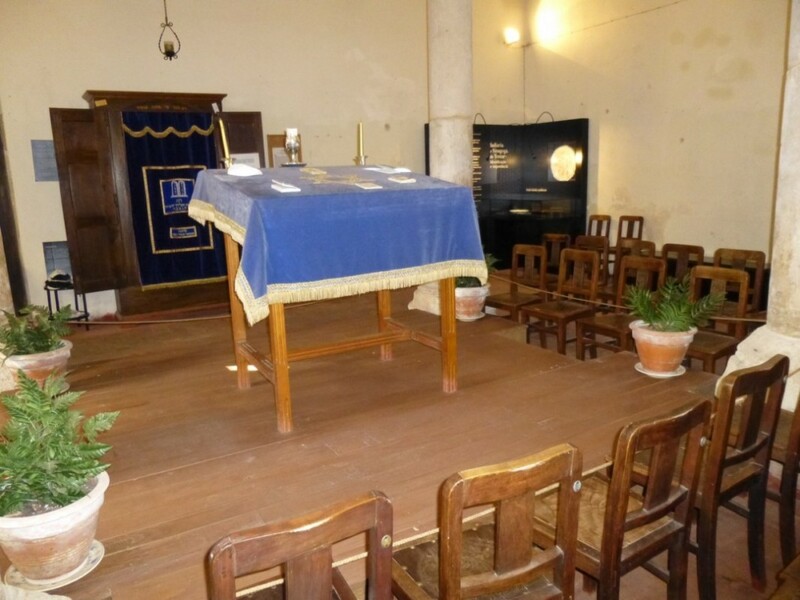 This building with the sanctuary became a museum in 1939 after Samuel Schwarz, a Polish Jew who immigrated to Portugal after World War I, bought it for that purpose. 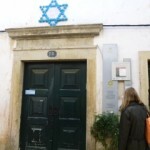 Today, the synagogue and museum, known as the Museu Luso-Hebraico de Abraham Zacuto (Zacuto being a famous Jewish scholar and mapmaker during the Age of Discovery), receives minimal government funding and survives on donations of objects and money from Jews around the world, in addition to the volunteer efforts of those who work there. Our tour guide, Jaime Rodrigues, is a high school teacher in Tomar with a love of history and a desire to uncover Portugal’s Sephardic past. Jaime pointed out that 20% of all Portuguese people, as well as Brazilians of Portuguese heritage, are descended from Jews who were forced to convert during the Inquisition. Although he has not verified his own heritage, he told me that Rodrigues was a popular name for “conversos” to take. 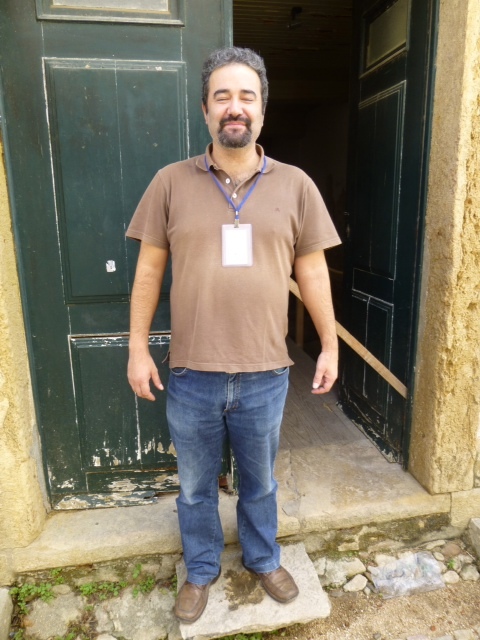 And this is Jaime himself, to whom I’m grateful for an informative tour as well as his volunteer efforts to uncover and promote Portugal’s Jewish heritage. The exterior of the Tomar synagogue. The Mikveh, or ritual bath, is in the process of archaecological recovery. 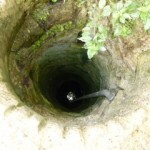 So is the well that supplied water to the Mikveh.